- How do you know where your new favorite ring is? X marks the spot! 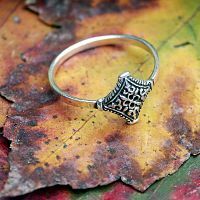 This Silver Pirate's Treasure Ring is inspired by the patterns found on old coins and exotic plunder from across the seven seas. And there's even a subtle "X" at the diamond's heart, just like you'd find on a map for buried treasure. Whether you're an old salt or a mere landlubber, this beautiful silver ring is sure to become your favorite bit of booty. The design on this ring measures just under 1/2" across. Its graceful diamond shape makes fingers appear longer and leaner. 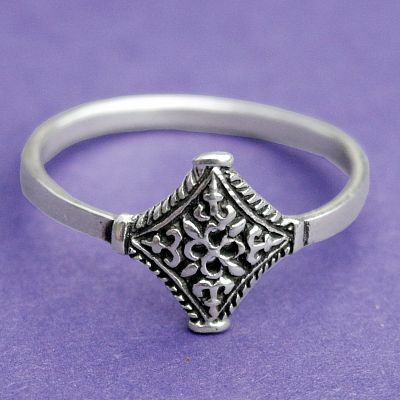 The ring is made of sterling silver, and available in sizes 5-9, whole sizes only. Do you have any other questions about our Silver Pirate's Treasure Ring?